I adjusted Norm’s recipe somewhat, it originally called for one cup of sugar, which as much as I have a sweet tooth, I knew that it would be too much sugar. Combine both sugars, the flour, and the cinnamon. Mix well, sprinkle one tbsp. of this mixture over the bottom of an unbaked 9″pie shell. Set aside. 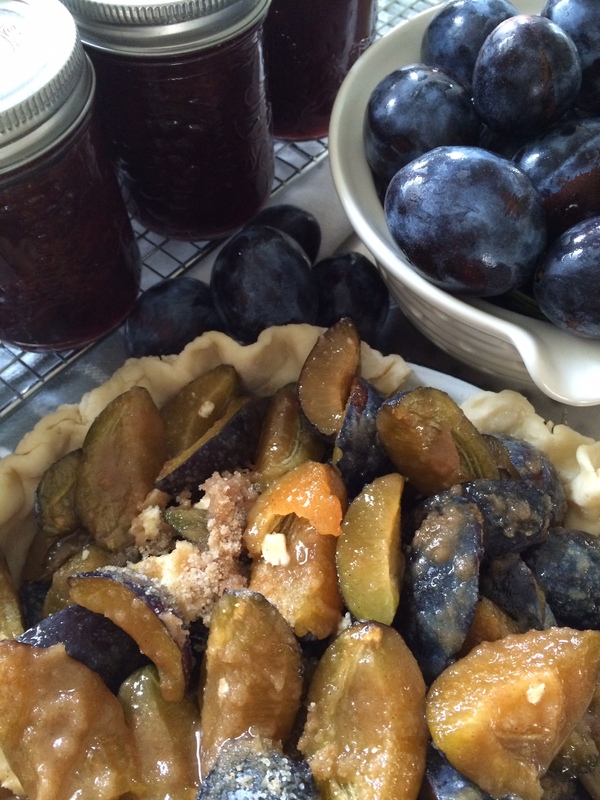 Combine the butter with the remaining flour sugar mixture, add the plums, stir well and pour into the pie shell. Top with a crust or sprinkle with a simple crumb top. Bake at 400F for 10 minutes, lower the heat to 350 F. and bake until juices are bubbling and are thick, approx. 45 to 50 minutes. NOTE, Even after reducing the amount of sugar, I would reduce the sugar by a further 1/4 cup, either omit the white sugar, or reduce the brown. The plum flavour was intense and rich, but the pie was still a bit too sweet. In a medium bowl combine; 1/2 flour, 1/2 cup brown sugar, 1/8 (1 ounce) cold butter, 1/4 tsp. vanilla extract, cutting the butter in with a fork. Once mixed, sprinkle over the pie. The vanilla is delicious is this recipe, adding a slightly exotic note to the topping. ← Never too many plums.